Just saw the abstract of this paper: The effects of climbing vegetation on the local microclimate, thermal performance, and air infiltration of four building facade orientations that was published 3/19 in Building and Environment. Authors are Irina Susorova, Parham Azimi and Brent Stephens. I am intrigued from reading the abstract (I don’t have access to the whole paper). The abstract is pasted below and I have highlighted a few parts. The use of climbing plants and other vegetation types as part of building enclosures has been shown to improve facade thermal performance under certain conditions, although detailed measurements of the impacts of plants on wall shading and local environmental conditions under multiple orientations in real buildings are currently lacking. Therefore, this article presents results from a series of experiments conducted on bare and ivy-covered sections of four pairs of walls of different orientations on existing university buildings during summer conditions in Chicago, IL USA. Over a period of nine days the research team monitored how existing plant layers impacted facade exterior surface temperatures, heat flux through the walls, localized outdoor air temperatures, relative humidity, absolute humidity, and air velocity immediately adjacent to the facades. Changes in nearby air temperatures and air velocity were also used to estimate the impact of the vegetation layer on air infiltration under hypothetical airtightness scenarios. The experimental results demonstrated that the ivy layers reduced exterior surface temperatures by an average of 0.7°C across all facades (12.6°C hourly maximum), depending on orientation and time of day. The ivy layers were estimated to yield a 10% reduction in heat flux through the opaque walls on average for the duration of the experiment, although again varying by orientation and time of day. These findings are consistent with other recent studies. The plant layers also reduced outdoor air temperatures immediately adjacent to the facades by 0.8-2.1°C, on average and varying with facade orientation. Relative humidity was higher inside the vegetation layers, but absolute humidity was actually not affected. Finally, the plant layers were also shown to lead to reductions in wind speeds immediately adjacent to the facades (averages ranging from 0% to 43%, depending on facade orientation and the presence of nearby obstructions), which when combined with measured differences in adjacent air temperature, were estimated to lead to an average reduction in air infiltration rates per unit wall area of 4-12%. Results herein provide further evidence that ivy walls can lead to small energy savings during summer conditions by solar shading and new evidence that additional energy savings may be achieved by reduced air infiltration rates because of the vegetation. Brent Stephens has provided a link to a PDF of a preprint of the paper. I have asked Brent Stephens to send you the paper. After you have read the paper you will see that this was not about microbiology, although I understand from Brent that they did collect some swab samples. I suspect we will see another paper later reporting those results. 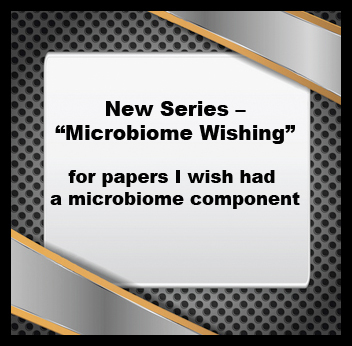 I wish more microbiology papers collected indoor environment/building science data to inform readers’ interpretations of their microbial analysis results and to help us develop a more comprehensive understanding of the microbiology of the built environment, especially the indoor environment. Is it OK to blog/post on microbe.net about papers that are not open access? I think you have completely misinterpreted my post. I did not say this paper was “about microbiology”. I was saying – it sounded really interesting and I wish there were some microbial samples to go with the other work they did. Glad you came across the paper. Irina Susorova, the lead author, has been exploring heat transfer impacts of ivy walls for a while now. She’s done a nice job of integrating architecture, building science, and plant biophysics in her work. These buildings were actually right on Jack Gilbert’s home turf at the University of Chicago, so some swabs could be done pretty easily. We have a few ivy covered building here at IIT as well. impact as well on both biological and non-biological penetration/infiltration. Do you think you could adapt your particle penetration test method to use particles that have test microbes in them?